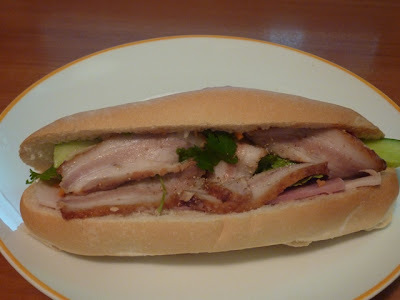 Footballers have been spotted eating them… Cabra school kids have munched on them… old ladies have eaten them on the train… Mimi my dog is always looking for left overs of them… Banh Mi Thit, more commonly known as Vietnamese Pork Rolls are THE delicious fast food in Cabramatta. And like most fast food, I don’t recommend you eat it regularly. It’s the multiple types of meat, pate, butter that make them delicious and fattening! Oh and if you wan’t to try something tasty but not as filling, try pate so.. vietnamese meat pies… also available at your local hot bread shop. I had a chicken roll the other day. YUM! Think I'm showing my age, Phuoc! The chicken is good from across the station.. but the meat balls are nice too… guaranteed to make me stomach sick tho!